The need for farm structures across rural North America that can stand up to the weather and challenges of farm life have led to the design of durable and practical steel barns. With their lower cost combined with durability and longevity, steel barns are now the best choice of twenty-first century farm building structures. Farmers are purchasing more steel barns because they need farm and field buildings that are as durable as their farming business. Traditional building materials require considerable long-term investment for upkeep and repairs. Steel barns do not. Steel barns are made from 100% recyclable, lightweight steel that stands the test of time. Your steel barn will take on the elements without chipping, distortion or other damage to the structure. Low maintenance steel structures means more time for other farm work. Steel barns will lower overall costs through their practical and affordable attributes. They are an excellent return on investment for farmers watching their bottom line. The structures can be built quickly and on site ready for use in a short time frame. And, they are low in operating costs and are energy efficient. An important bonus is that since a twenty-first century steel barn can be engineered and manufactured to your custom specifications, the straight-wall structure’s length and height will meet your farm’s requirements. And when your farm grows, your steel barn will grow with it, since the length of steel bars can be easily extended with a lean-to frame addition. Your customized barn includes your choice of colours, from shades of grey, reds, blues, or neutrals like tan or green. Colour choices includes colours for trim, walls and the roof itself. Customization gives you a wide-range of options. You can add insulation to your barn for year around livestock climate control. Choices for wall and roof accessories include trims and flashing, spans and lean-to additions, and insulation. For example, customizing allows you to control the amount of light in the barn by adding in natural light if necessary with the addition of skylights. The durability and security of a steel barn also makes them ideally suited to protect your heavy equipment from damage and rust, and to keep your livestock safe and secure from the elements. 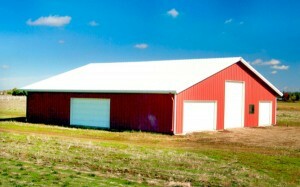 You can even use steel barns for storing seasonal farm equipment, from harvesters and plows, to combines and tractors. Safe, secure and durable, steel barns are the only choice for twenty-first century farms!